While we may be praying for the frequency of warmer days to increase when the sun is out and shining life doesn’t seem so bad. And it’s on those days that we do one of two things, daydream of the 85 degrees or put on our not so puffy jackets and hit the road. For argument’s sake, we’ll do both today. The park itself is 20-acres and connected to Millennium Park via the BP pedestrian bridge. Meaning you can run or scoot between the two. Did you notice our use of the word scoot? Nope, that wasn’t a typo you can rent a scooter or a pair of rollerblades! (Hey, if kids can scoot, why can’t you?) 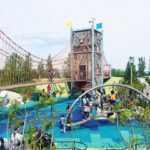 In addition to all the wheeling around, there is a climbing wall, picnic grove, play area, mini golf and tennis courts. In our opinion, there’s no way you won’t have fun at. Ok so for this part of the post, we ask you to use your imagination. As some of what we’re about to describe requires sweltering heat and swimsuits. Let’s begin with a description of the park. Millennium Park opened in 2004 and forever changed the landscape of downtown Chicago. 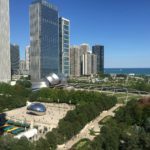 With 25 acres of breathtaking landscape, spectacular architecture and an iconic collection of public art, Millennium Park is Chicago’s premier green space. We’ll start with artwork now turned landmark. 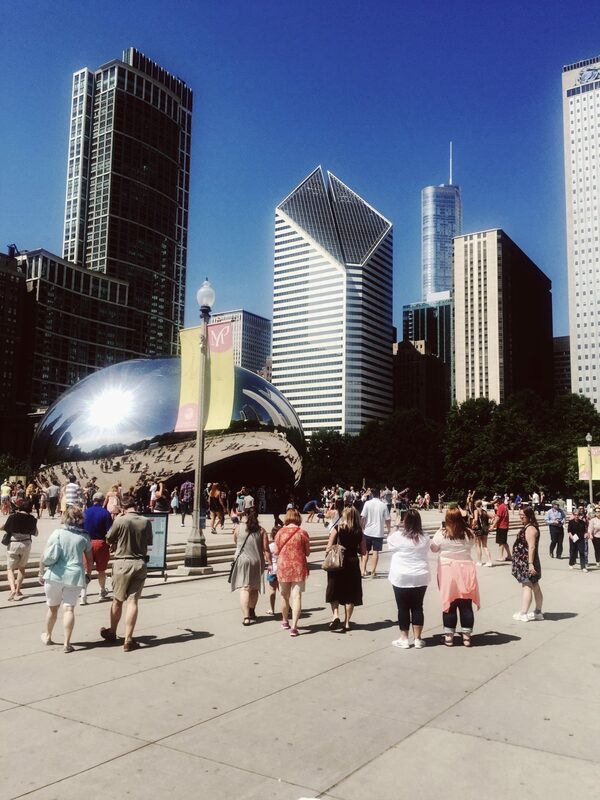 No matter what time of the year, there are always people crowded around Cloud Gate, or as it’s affectionately known, The Bean. Constructed between 2004 and 2006, the sculpture is nicknamed The Bean because of its shape. Made up of 168 stainless steel plates welded together, its highly polished exterior has no visible seams. It measures 33 by 66 by 42 feet (10 by 20 by 13 m) and weighs 110 short tons (100 t; 98 long tons). The artist’s design was inspired by liquid mercury and the surface of the sculpture reflects and distorts the city’s skyline. Visitors can walk around or under The Bean’s 12-foot (3.7 m) high arch, making it an ideal spot for selfie-taking. Whether you’ve just moved to Chicago or you’re showing someone around town, stopping by Cloud Gate is a must. Ok ladies and gents, grab your imagination hats! Today we imagine that the breeze is warm, the air is humid and the sun is shining. 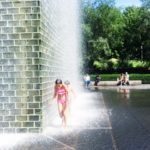 It’s the perfect day for a trip to Crown Fountain or as we all like to call them “The Faces”. 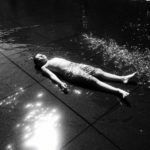 Crown Fountain is an interactive work of public art, composed of a black granite reflecting pool placed between a pair of glass brick towers. The towers are 50 feet (15.2 m) tall, and they use light-emitting diodes (LEDs) to display digital videos on their inward faces. The water operates from May to October, sporadically cascading down the two towers and spurting through a nozzle on each tower’s front face. The sounds of laughter and squeals can be heard from the park’s entrance, as children and adult visitors splash through the water and wait for the faces to soak them to the bone. This spot is probably our favorite to cool off in the summer, and worth visiting at least 100 times.